creme-bru-log: an online resource for critique and tastings of creme brulee from around the world! it is day, and i am inside of the house of creme. havana- 1957…may 13- 8:53 pm-i hear dogs barking as i run thru the alley…old speakers are blasting that classic beny more…”que bueno baila usted” and people are cheering and dancing and the general ocean wash of hundreds of voices all washed into chatter and im looking cuz there is a party somewhere. i trip over a garbage can filled to the brim with old chicken bones and other food waste and tumble headfirst thru the slats of a rickety wooden fence and the dogs have caught up to me, and feathers are flying and ive scrapped my knees and tore my favorite pants.. but oh thank god they are friendly! and now they are giving me kisses and licking the chicken off of me…good dogs!! and wouldnt ya know- i look up and somehow we have stumbled into the party!!! friendly guests help me up and dust me off and fix my hair- pulling me into the swing of things and now we are just jamming to that beny more and banging on an old bongo drum…and im dancing with some sweet seniorita but i keep seeing her out of the corner of my eye… there is this sweet older woman who keeps motioning to me to follow her thru a door which appears to be leading to a kitchen of some sorts…i dont normally go with strangers but i follow and oh the smells…garlic and olive oil and black beans in a pot and frying pork…but these are not what she wants me to see…somehow she is onto me and knows my true passion…”i know theese is not the brulee…” she says…”but perhaps is close enough?” close enough and miles beyond though not much to look at at first the cream of her enchanted flan fills my mouth- tastebuds and tearducts flood with joy and i feel the eggs in their primitive state, knowing both at once the potential that is carried in any egg, and the full realization of what an egg, whipped into shape, can become…i carry the egg in my mouth for awhile like an expectant mother…then send it down with the pride of a parent watching their little egg pass the bar exam..i know i am safe with this flan… here in this kitchen with this lovely woman such a fine cook smiling with the knowledge of those who have come before her…and her husband lights a cigar and passes it to me and we lean back in our chairs with a little rum in the bottom of our glasses and just let it be is are was were in heaven havana again. 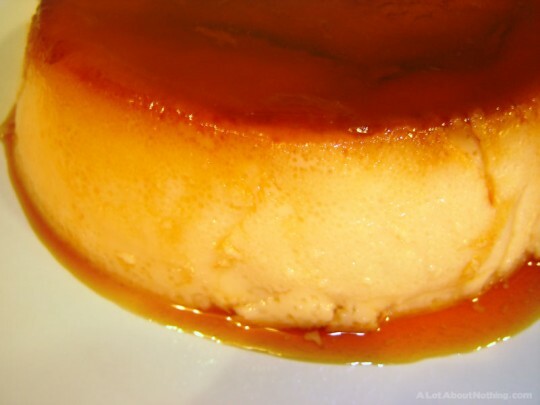 shown here: a stock photo similar to the flan at back to cuba restaurant- nashville, tn. THE STANDARD TO WHICH ALL OTHER BRULEE SHALL BE HELD. i am in a forest of cream. my feet sink into sopping wet puddles of deliciousness with every step forward…all around me are trees of sugared caramel all covered in sweet lace burnt amber leaves…i see a volcano explode from afar-at first i am frozen with terror but then i remember that i am a magic child and i have the ability to freeze the lava flames and turn them into sugar! i walk across the creamy forest up to the frozen lava flame and crack off a piece, popping it onto my tongue- sublime! i notice at the bottom of the sugar flame a melted pool of caramel connects it to the earth…i dip my finger in for a taste and i am at the county fair now eating the greatest caramel apple on a stick- perfection! i notice two hummingbirds sitting on the shoulders of a younger mark twain as he licks the caramel off the bottom of his brulee… and for the first time the idea of huckleberry finn pops into his mind and he smiles with the knowledge of future success. he notices me and holds up his brulee in a “cheers” gesture- which i return- thrusting my brulee high into the air in mutual celebration. 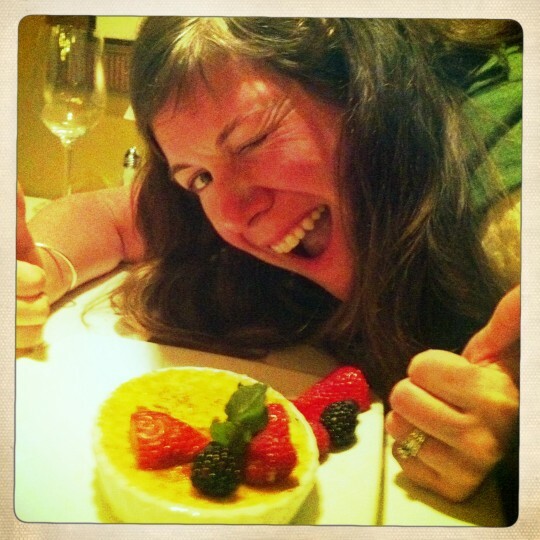 ladies and gentleman we have found the standard to which all brulee shall be held up to and judged against- the fabulous creation of pastry chef angela reynolds at nashville’s miel restaurant. 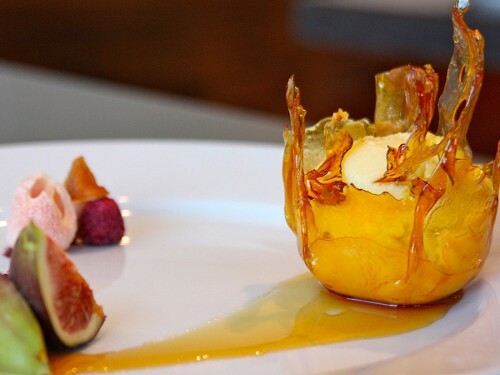 shown here: the volcanic brulee de miel!